Spend a few hours in El Nido, at the very northern tip of Palawan, and you’ll understand what they mean by paradise found. If El Nido and Palawan are two places you’ve never heard before then it’s about time you get educated, my friend. Unless you’ve been living under a travel rock, the Philippines are your go-to travel destination for 2017, and at the top of the list is El Nido. 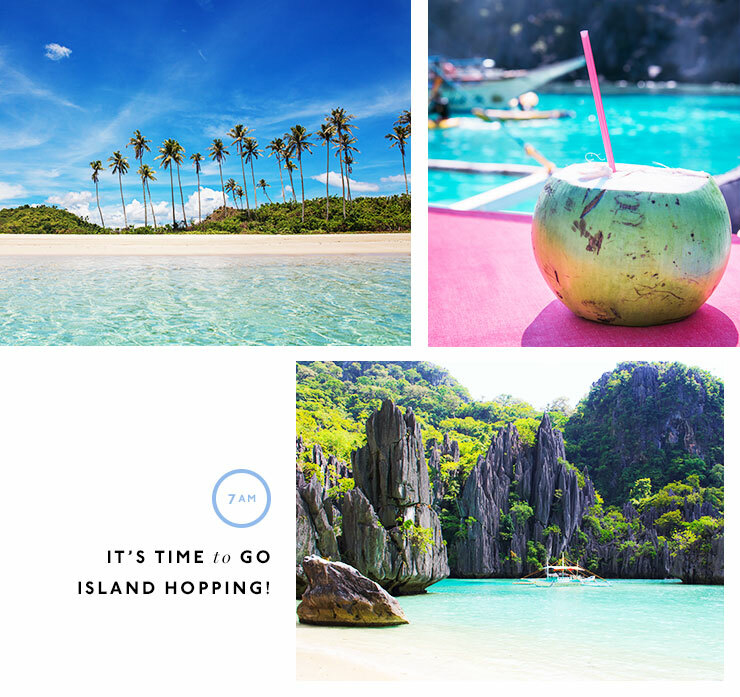 This island paradise is your gateway to the Bacuit Archipelago; otherwise known as one the most dead-set gorgeous places on earth. We’re talking limestone cliffs, the bluest of blue lagoons, all of the butterflies and even the odd sea turtle, just hanging out, on the island. The best part about El Nido is that it still remains largely a backpacker’s paradise— which brings me to my next point. When it comes to accommodation (amongst other things) this is not Bali. We’ll just leave that sink in for a moment. So whilst there are resort islands just off the coast, meaning you can make your stay as luxe as you like, you also won’t be getting anything Seminyak standards for $45AUD a night. So now that your expectations are in order, here’s how to have 48 amazing hours in El Nido, Palawan. Touch down in El Nido after your quick (it’s only 1 hour) flight in a 50-seater plane from Manila. You can opt for the cheaper route and catch a regular plane to the capital, Puerto Princessa, but be prepared for up to a 9-hour bus ride, or 5 hours in a van, before you reach El Nido town. Arrive in El Nido town! While it isn’t exactly where you’ll find the island beauty you’ve read about, it does have its own charm. Drop your bags and let’s get going! You’re starving, we get it. And while you might be on an island and therefore in an automated seafood state of mind, you should really head to Trattoria Altrove for the kind of pizza Nonna would be proud of. But look, if you just neeeeeeed to have some fresh fish; make a beeline for El Nido beach, where you’ll find an entire street of seafood restaurants where you can pick your fish from the buckets out front. Find a tricycle (it won’t be hard, they’re everywhere), and tell your driver to take you to Las Cabanas, also known as Marimegmeg beach. As soon as you hit the bottom of the stairs you’ll know exactly why you’re staying here. All. Day. Long. With Limestone Islands in the distance, and crystal blue waters perfect for dip, tan and repeat, this is exactly why you come to an island paradise. The best part about this spot though is the sunset. When the sky tells you it’s time, grab a happy hour beer from the Beach Shack and walk all the way down, under the giant flying fox and turn left (turn right and you’ll be in the water), then get ready for the best sunset of your life—not even kidding. 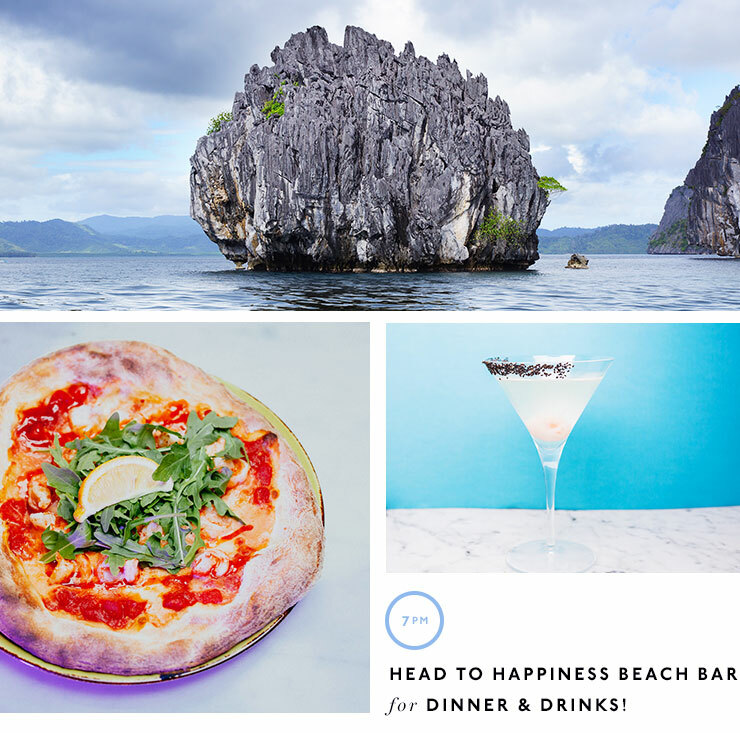 If El Nido is paradise found then Happiness Beach Bar is, you guessed it, happiness found. Run by a couple of Israeli mates that decided island life was too good to ever leave, this is the sort of locale you could happily move into. In my humble food loving opinion this is the best food on the island, and I wouldn’t blame you if you come back the next night. With beats, views, house made hummus (the kind that will have you licking your plate) and amazing margaritas, you’ll stay all night. Lets be honest, you’re here to island hop. If you’re not, you’re obviously lost. Today you are about to see some of the most stunning vistas of your life. You can book your tour the day before (recommended) or the morning of, at the beach in El Nido town. There are four tours to try in El Nido and some legend conveniently labelled them A, B, C, and D. Seriously. The word on the street is Tours A and C are must-dos, but because you only have 48 hours you can only choose one. This time round you’re doing tour C because you need to see Hidden Beach and snorkel in the waters of Tapituan. Kayaking through the small and big lagoon will just have to wait (it is seriously awesome, maybe you stay another day?). Take a tricycle to Republica Sunset Bar for the greatest Spotify playlist of all time, cold brews and one seriously epic sunset. Run by a couple of Spaniards, expect tapas, paella and a healthy serve of Latin vibes. You’ll be here all night so don’t even bother making other plans. Morning son, you’re up early! Make the most of your last day in paradise with a visit to Nagkalit-kalit waterfall. The best way to do this is to (you guessed it) hire a trike, and be prepared to break a sweat—aaaaand get a little wet. This is up hill (because it’s a waterfall guys, geez) and you will be crossing many a stream, some deeper than others, and walking through some lush grassland. If you’re lucky, your lovely driver will climb up with you because he took one look at you and assessed your complete lack of (any sense of) direction; but if they don’t, there are little red markers lining the way. You’re looking at about a 40-minute walk up, and you’ll need to bring some small change to pay the admission lady at the top. Luckily for you once you get there you’ll be able to take a dip, and because you’re up at a sparrow’s fart you’ll have it all to yourself. Hot tip: BYO snacks. 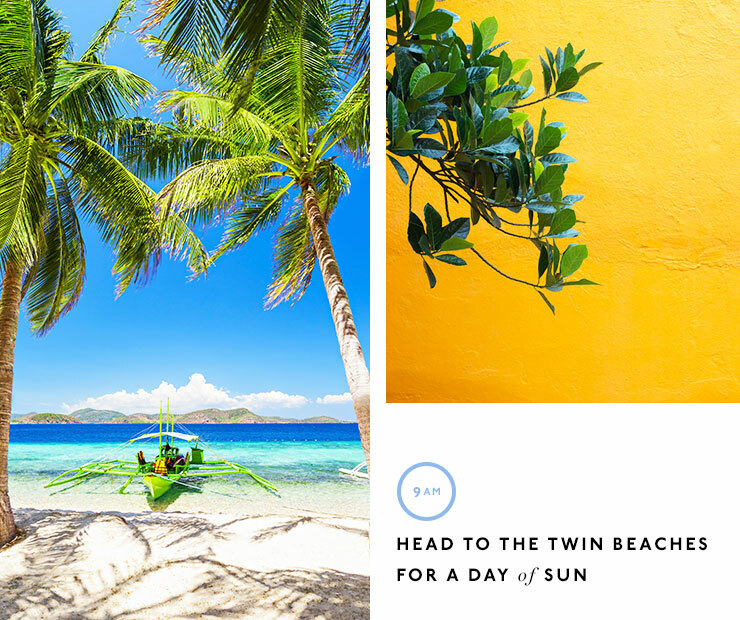 Head to the Twin Beaches otherwise known as Nacpan and Calitang Beach. The road isn’t great, but it is 147% worth the effort. Waiting for you will be crystal clear water an the whitest of white sands. Whether it’s a cold beer or a fresh juice, one of the family run restaurants on the shorefront will help you out. Make sure you climb to the top of the lookout (if you ever manage to get out of the water) and have a seafood lunch. Head back to El Nido town to book another night in time for your flight. Check out where else you should be travelling this year.